Caturday is the perfect day to give yourself a catnap. This fuzzy Cheshire Cat is just in it for the naps, much like every other cat I’ve ever met. His floof has floof, and one can only imagine the grin on him when he’s awake. Where do you need a little bit of wonderland in your life? This kitty would be great in a bedroom or nursery, soothing someone to join him in sleep. 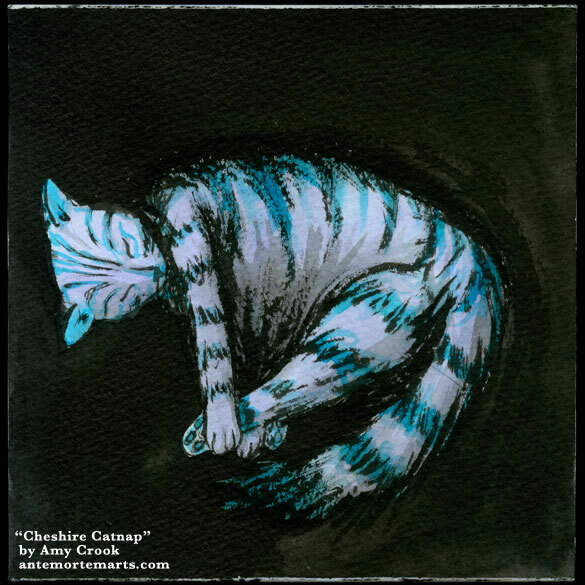 Cheshire Catnap, 6″x6″ brush & ink and ink wash on Fluid watercolor paper. 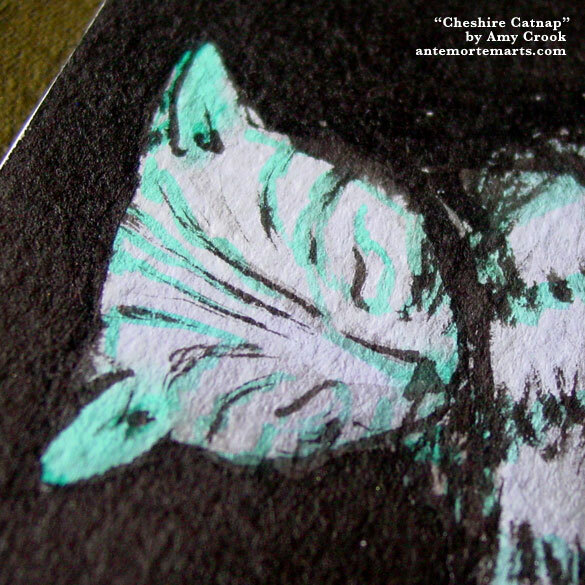 Above, you can see this mystical kitty’s sleeping face, soft and bright blues giving its markings some mystery. 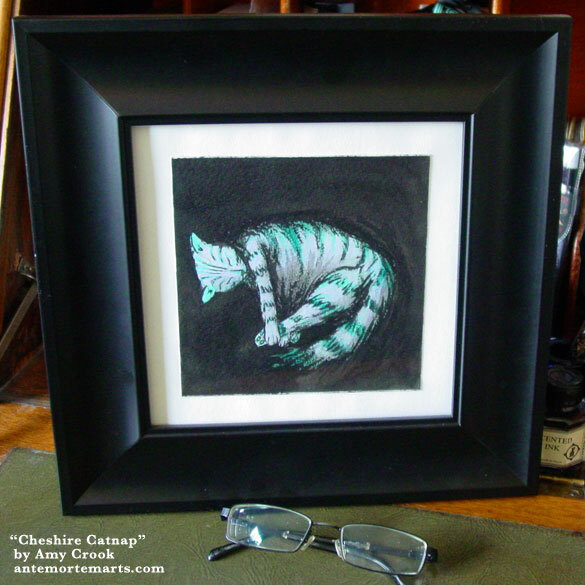 Below, he’s tucked in a temporary frame, waiting for his forever home. 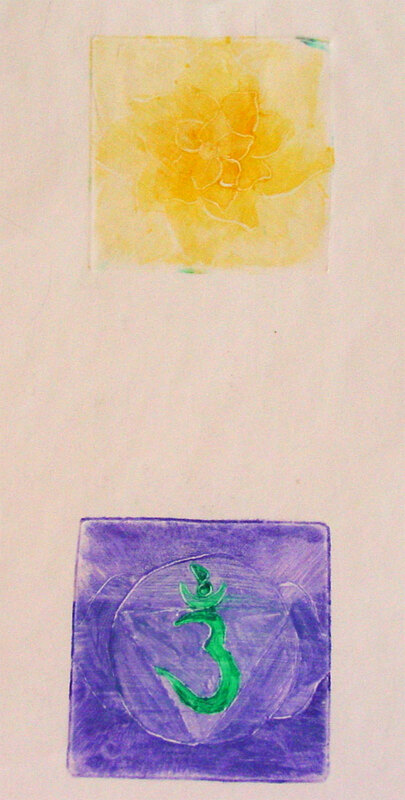 I went through a period where I was fascinated with the idea of the chakras, and I did several monoprints related to them. This one uses the colors are all of the lower chakras to make flame, and the symbols for the 2nd and 6th chakras, desire and the third eye. Our culture has a whole myth of “love at first sight” that I’ve never really bought into — I think that what you get at first sight comes from somewhere else, though it might eventually be pulled upward into the realms of the heart. At first sight all you get is a visual, some social cues from dress and superficial action, and no idea of what the person is really like inside. 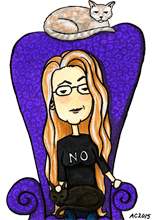 This piece reflects that idea, that we expect to see into them with our third eye, when really we’re seeing with our sacral instincts, desire and wanting rather than the love that comes from accepting a person’s flaws as well as their really nice body. 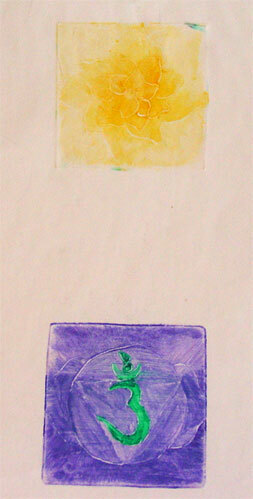 At First Sight, 2″x6″ monoprint on 6.5″x9″ watercolor paper, $299 with free shipping. This is a much larger piece than the monoprints I’ve been posting up until now, and my terrible photography is unfortunately one of the reasons I’ve been putting off posting them. 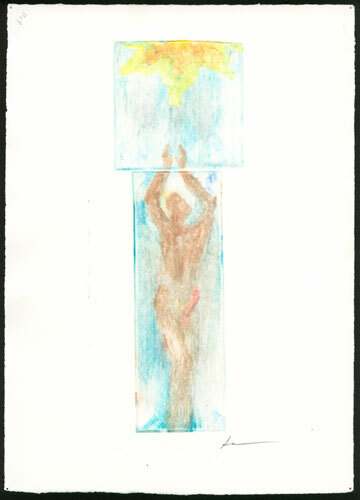 The page comes out much more buff-colored than the reality, which is the soft cream of heavy watercolor paper. 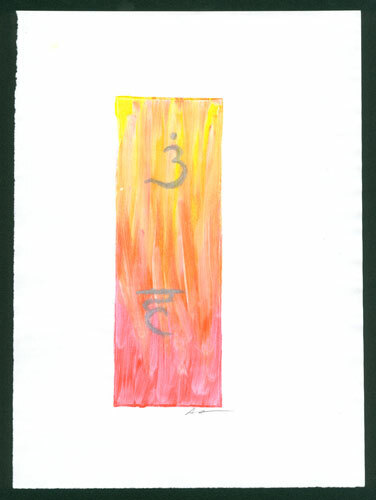 This is the third of my monoprints featuring chakras, and by far the largest. 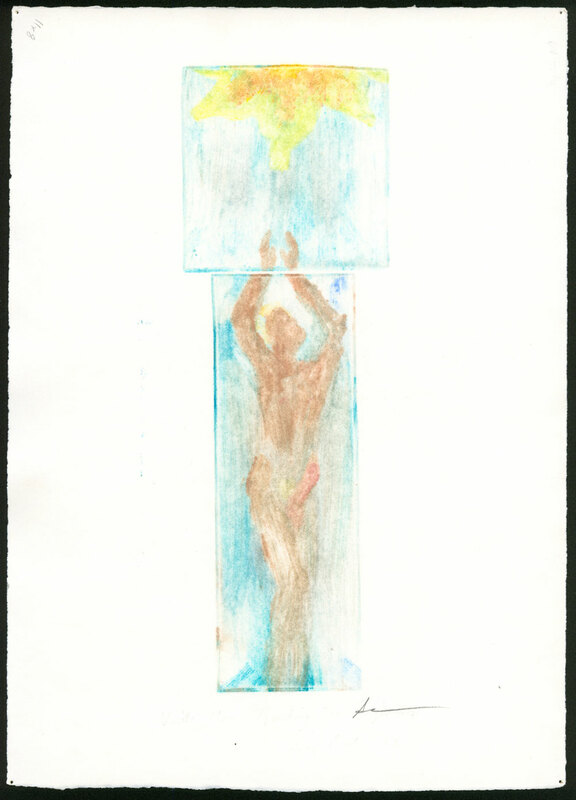 When I printed it the colors ran, so that the top image came out clear, and the lower chakras were blurred into each other and their colored backgrounds. You can see them more clearly in the detail images below, and you can always click on any image to see the larger version. 7 Chakras, 11″x30″ monoprint on watercolor paper, $399 with free shipping. This one-of-a-kind print is on a single sheet of thick, archival watercolor paper, and will need to be framed or matted to be suitable for display. I’m happy to help you out with that for a small additional fee. Want a payment plan? You can do 4 automatic monthly payments of $100 if you’d like — I’ll ship your art as soon as I get the last payment. The plates on this page are all 3″ wide, while the page itself is 11″, and the whole piece is 30″ long (2.5 feet!). I’ll probably ship it rolled, unless you choose to have it framed.